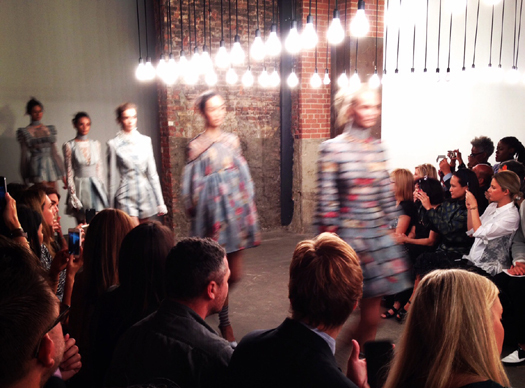 You can’t always be lucky during the New York Fashion Week, especially when you don’t pay attention to the details! I once again got my lesson this morning, when a missed for a few minutes the Project Runway show, though I knew that this is the only NYFW show that starts earlier instead of the regular half-an-hour-later, because they are taping the whole event! Anyways! Hopefully, next time I will be on time; meaning earlier! 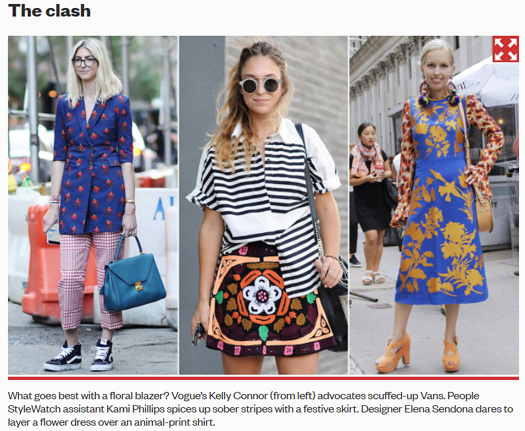 Yet my look – including a Jonathan Saunders floral dress and oversized Vickisarge pom-pom earrings – made waves in the street style scene outside the venue and that really boosted my confidence for the rest of the day! What I realized about New York was that people are getting more and more fashion-conscious, even those with zero previous connection to it. I received nice comments from an array of people – from photographers to restaurant staff and more! To redeem for my morning failure I attended a really fabulous show right after. 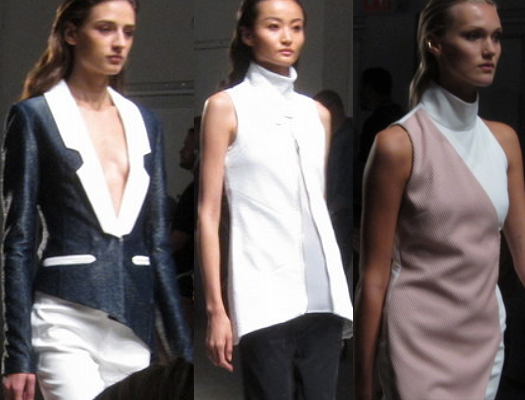 Yigal Azrouel did a great job in presenting a collection full of romantic motifs, minimalist lines, bold colors on a dark backdrop and soothing neutrals. It was wearable, yet exquisite! Then at Zimmermann – which was a very succesful show with a long line of attendees outside the venue and a strong street style scene – romanticism and retro girliness peaked, but it all looked modern and relevant. Many ladies attending the show were proudly sporting their ethereal Zimmermann dresses combined with stappy sandals and statement jewelry. The venue had a cool urban ambience and the cloths looked really expensive! The brand has positively evolved! Karigam at Skylight Clarkson wasn’t that packed but eventually it was a nice surprise with tasteful minimalist aesthetics and even more impressive was the Kye show in an intimate space inside the same venue. 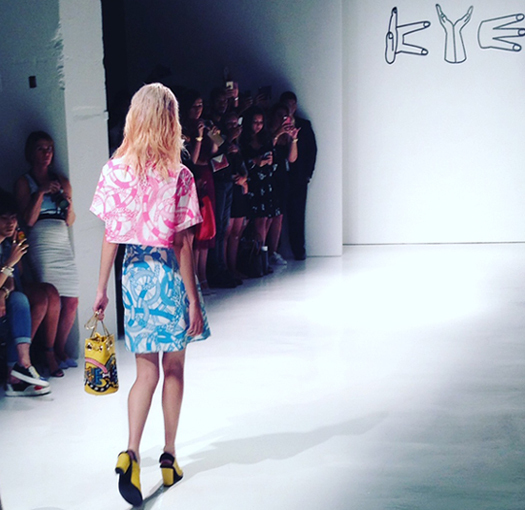 Kye was modern, fun and unexpected but also balanced and chic! Later, NYFW-star couturier Zang Toi presented a collection inspired by the island vibe of Santorini but exaggersted a bit to meet his signature all-glam style. 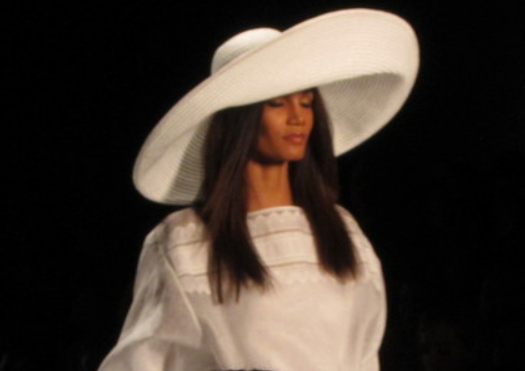 We saw again floor-sweeping capes and gowns but what I loved the most was the super-wide-brimmed white hats; perfect for the brightest sunshine! I concluded my day with a luscious dinner at Clocktower inside the New Edition Hotel and then met with the Diego Binetti team at Beautique Lounge for champagne and drinks mixed with happy grooves! We danced a lot, I must say! So stay tuned Fashion Babes!